Value in science fair projects? Corey D. Kaup's "Nothingness Theory"
Dinosaur extinction--"The Great Chicxulub Debate"
Templeton Prize...good idea; bad idea? History/philosophy of science...I think so! Science interests...how is it done? There is nothing illegal here just an ethical issue. You can with great intentions name a star of a deceased individual, your pet, or whatever and as Wikipedia says: "Once the star is named..." the seller publishes "...its telescopic coordinates in a book called "Your Place in the Cosmos."" and "...is "registered in book form at the U.S. Copyright Office"...." The ethical issue is that the star name is not recognized as an official astronomical designation..."The International Astronomical Union (IAU)...has the internationally recognized authority to name and designate newly discovered stars, planets, asteroids, comets, and other heavenly bodies. The IAU's nomenclature...is the one used by professional and amateur astronomers all over the world. It is not for sale." 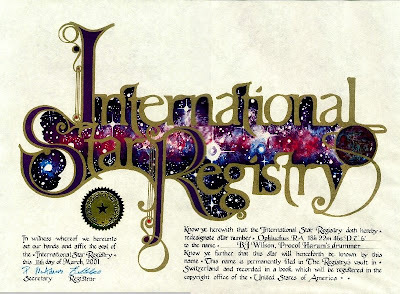 No where is it stated that the star name is official. It's a gift of the heart and mind but just be aware of authenticity. "Buy a Star, But It's Not Yours"